For the past eleven years Bruno Ferrandis has led the Santa Rosa Symphony with skill and balance. After this season he is stepping down to return to his home in France. I was able to see him last weekend in a program titled “Ode to California” in the lively acoustics of Weill Hall at Sonoma State, and enjoyed his genius for programming and the wordless way that he communicated his insights into the music. This has been a busy year for North Bay patrons, as five contenders had try-outs with the Symphony in a bid to be the next Conductor, each with thoughtful programs. 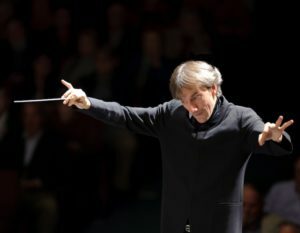 On March 29 the board and musicians unanimously chose the new conductor, Francesco Lecce-Chong, currently the conductor of the Eugene Symphony and associate conductor of the Pittsburgh Orchestra, and he will be transitioning into his new job here by leading three concerts next season and six of the seven classical concerts the following year. While I am looking forward to this rising star, I was keen to hear Ferrandis in one of his last appearances (he conducts one more set of concerts, May 5, 6 and 7), and on Sunday, April 8, his “Ode” delivered. But aside from the twisted premise (which is sort of normal for opera), the music was divine. Ferrandis led the Santa Rosa Symphony in a stirring performance from the first soft hesitant twitters to huge gushing phrases, and with a pause that stretched almost to the point of discomfort. 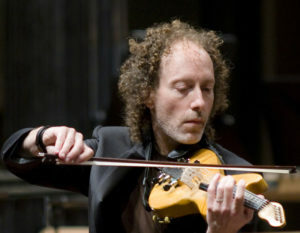 That was just a warm-up for the blazing electric violin of Tracy Silverman, who was the soloist in John Adams’ The Dharma at Big Sur. And in fact, Adams wrote that piece for Silverman in 2003 for the opening of the LA Philharmonic’s new Disney Hall, and it was also appropriately an homage to two great California composers, Lou Harrison and Terry Riley. Although the structure of the piece paralleled the Wagner in its slow build-up of washes and powerhouse apotheosis, this was a joyous celebration of life devoid of Romantic yearning. Tuned partly in just intonation, we came away with an expansive Pacific Rim sensibility that evoked Harrison’s gamelons and the sliding sonorities of Riley’s South Indian ragas. Here two harps and pianist Kymry Esainko spattered rhythmic counter-attacks to the violin’s long phrases, while a bevy of percussionists (including our own Ward Spangler and Kevin Neuhoff who perform with the Berkeley Symphony) delivered a backbone of vibes and timpani. Silverman, who was an early member of the famed crossover Turtle Island Quartet, came back for an encore that was expressive and improvised, showing us the startling capabilities of his six-stringed electric instrument. Based on Carlos Santana’s “Europa,” Silverman created runs that were fearsome and slippery over a rhythmic looping, and then turbo-charged it with dense electronic distortions and wailing top notes like Jimi Hendrix. From the long applause that followed, one could hear that the Santa Rosa Symphony has strong support from an adventurous audience. After intermission Ferrandis changed gears to Sergei Prokofiev’s Alexander Nevsky with the back of the stage filled with the Sonoma State University Chorus. This was a suite from the score that Prokofiev wrote for the movie directed by Eisenstein, originally used by Stalin to foster the patriotism he needed to break his treaty with Hitler and enter World War II. And to that end, we can hear Prokofiev’s use of village scales and the stirring phrases of youth, amid the deep cracking of ice and the sharp winds of the North. The very first notes sketched out a broad canvas, with bone-jarring contra-bassoon and high keening violins playing in an ancient church modal scale. The seven movements of this cantata were deeply evocative, with torrid strings, stern trombones, and sharply dissonant cymbal, and the chorus was tight and excellent in its Russian diction. Ferrandis carefully conducted each phrase, and when they swelled and the brass came in, his long arms and large expressive hands slashed out gestures until I wondered if blood would spill. Actually, it was probably democracy that was being sacrificed on this musical altar, but when they sang, “Arise, People of Russia,” I was ready to stand and cry “Da!” with the rest of them. Creepy and satisfying! These are the long and thoughtful programs I have come to expect from Ferrandis, whose last concert here, “Au Revoir, Bruno,” includes Mahler’s stirring Symphony No. 9 and a World Premiere by Czech composer Michal Rataj. The Santa Rosa Symphony performs those next concerts and bids adieu on May 5, 6 and 7 at Weill Hall on the campus of Sonoma State. See srsymphony.org for tickets and program notes, along with exciting information about their new pick, Francesco Lecce-Chong. Photo, top, of Tracy Silverman, courtesy of the artist; below, of Bruno Ferrandis by Susan and Neil Silverman.